Gweru youths who benefited from the Rural Solar Market Development Project have lauded SNV Netherlands Development, a non-profit international development organisation, for changing their lives for the better. Speaking at the first of the eight leg national Solar Fair in Gweru on Saturday, the youths said from being loafers who relied on their family members for upkeep, they had been turned into breadwinners, thanks to the International Labour Organization (ILO) jointly-funded project. “The project brought a big change in our lives. As of now, we are actually taking care of our parents and members of the extended family, realising between $200 – $350 every month, and that being part-time employment,” revealed Mabandla Mdhuli, one of the beneficiaries. 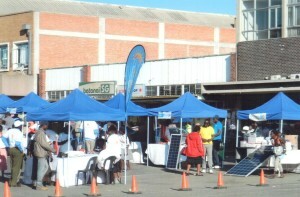 Speaking to 263Chat at the fair site adjacent to Midlands Hotel along Main Street, Gweru District Youth Officer Aaron Mashiri said SNV approached his ministry and asked them to identify youths from rural constituencies to be trained, and linked them to major solar product distributors. With power utility ZESA failing to cope with national demand, there has been a marked demand for energy-generating products. Said Mashiri: “We targeted 20 men and 22 young women in Gweru, whom we enrolled at Kaguvi Training Centre along Harare Road. Farai Munukwa, another beneficiary, said solar products are being hailed by people living in the villages, given a backdrop of rural folk getting health complications after being affected by poisonous fuels and gases like paraffin that they used to generate energy. City folks are also having to the products as ZESA ‘slaps them across the face’ daily with its electricity load-shedding. Musa Moyo, a solar energy distribution agent said they were selling solar products ranging from $15 to $135 and handed a two-year warranty card together with the products, on a five-year warranty. They included LED lights, chargers, and stoves, with the products also found at all Total branches nationwide. Greenation Solar Products and Summersrand Alternative Energy had on exhibition solar tiles, and managed to clinch quite a number of deals. “The solar roof tiles go for $35 each and you only buy a few of them, depending on the rate of power consumption by the gadgets connected to the energy source. A single tile generates 10watts,” informed Vumani Zenzo Ndebele from Greenation. According to Mashiri from the Youth Ministry, the fair, on its second year running, will also be hosted by seven other areas across the nation before year end. GreenDot Solar, ANB, GreenLight, Exampler, in addition to Greenation Solar Products and Summersrand Alternative Energy formed part of the exhibitors.